While we highly recommend hiring a professional painting contractor to paint a home’s exterior, you may be committed to a DIY approach. If so, use these exterior painting tips and tricks to help make the project easier. Homeowners depend on paint to both beautify and protect. If you have decided to put the power of paint to work for your home’s exterior firsthand, use these top exterior painting preparation steps to succeed. Plan based on weather–rain can easily ruin a fresh coat of paint and undo hours of hard work, so weather is truly a critical component of a successful exterior paint project. Refrain from painting when the temperature drops below 40°F. Always reference the paint can label for additional insights on weather-related directions. TIP: Low temperatures and high humidity are a bad combination. Generally speaking, the higher the humidity, the slower a product dries. Take some time in advance to choose paint, primer, finish and painting tools. Here are some top tips. Most acrylic/latex paints will work on the majority of popular exterior home surfaces, including wood siding, brick, fiber cement, stucco and EIFS (Engineered Insulation Finishing System). As a general rule, UV resistance, which prevents fade, is one of the main benefits that separate the quality of one paint from another. Besides the sun protection, higher quality paints have great expansion and contraction characteristics, resistance to wind-driven rain, mildew and dirt pick-up resistance, and a number of other benefits. Acrylic/latex paints like Aura® Exterior Paint and Regal® Select High Build are generally the best choice for exterior painting projects. Latex paints resist the sun’s rays and are highly compatible with all the substrates mentioned above, so they are not as prone to fade like oil-based paints. Exterior primers vary by substrate. Your local Benjamin Moore retailer can help you choose the right one for your exterior surface. Favorite finishes for exteriors include low lustre or satin, as they tend to resist dirt pick-up compared to flatter finishes. Many homeowners opt for semi-gloss for that little pop of shine on the trim, shutters and moldings. Brushing or rolling? At different times of your painting project, you will likely use both. Using a roller increases production and spraying the paint can speed up the project. The important thing when it comes to brush or roll is that you use a quality tool. Not all paint brushes or rollers are the same and results may vary, so we encourage you to use the most high quality brushes or rollers to support your hard work. Your local Benjamin Moore retailer can help you make the right selection. Paint sprayers require a certain level of expertise. 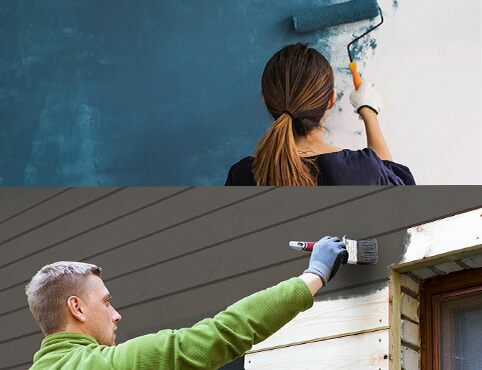 For the average DIY-er, we don’t recommend them, however your local Benjamin Moore retailer can coach you on this topic if you are committed to spraying. Clean. Dry. Dull: If you’ve ever been around painters, you may be familiar with this painting mantra. Here’s what you need to know for each of these crucial activities. If you are power washing your home with anything other than water (e.g., a chemical cleaner), mask your plants and landscaping with plastic drop cloths, taped down to stay in place should wind pick up. Any part of the perimeter that you don’t want cleaner to touch should be covered, especially if you are using a chemical cleaner. After power washing, mask windows too, to avoid time-consuming clean-up of dried paint flecks on window panes later. A fully dry substrate is imperative. Don’t paint until your exterior is fully dry. For example, a wood substrate will need its moisture content to be below 15%: a Benjamin Moore retailer can help with more information on measuring moisture. In general, your new paints adhesion could be negatively affected if applied over existing high gloss surfaces. Fortunately most exterior houses aren’t high gloss but many doors are. If you encounter a surface that is high in gloss it’s best to degloss with sandpaper or a liquid deglosser. If there is existing paint that is peeling, you need to discover the cause and correct it. Be sure to smooth the edges of any areas where paint has peeled. Sanding provides a smooth service that improves the adhesion of both paint and primer. We recommend always priming prior to caulking and patching. Remember the peeling areas you sanded down in Step #3? You’ll need to spot prime (applying primer to particular areas) surface areas that are not in sound condition. Note that brick should always be primed entirely. Fill in minor cracks and gaps around windows and doors with a high-quality paintable caulk. 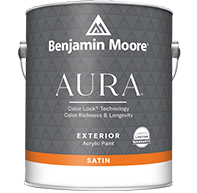 Your Benjamin Moore retailer can help you choose the right one. Caulk between one piece of siding to the next and in between flashing (the metal strips that keep water out). The smoother your surface, the more uniform your paint job will look. Always work from the top down, painting gutters and eaves first if you want them to match the color of your siding. Paint trim before the main surface of the house first as well. Be prepared to apply two coats of premium exterior paint. TIP: Paint is formulated equally for spray, brush and roll applications: It’s your choice. • Start by using a paint brush to cut into the trim. • Then, cut into in any areas below drips or decorative moldings. • After cutting into these areas, use a roller to paint from side to side, applying paint over a 3-4 foot section of wood siding. • Once all the paint is applied, use a paint brush to feather the paint and ensure a smooth finish. For brick, acrylic/latex paint is still your best choice. Don’t paint over efflorescence, which is a crystalline deposit of salts that often forms on brick when water is present. Efflorescence must be removed by wire brush or other tool. Acrylic/latex paints like Aura® Exterior Paint is generally the best choice for exterior painting projects.